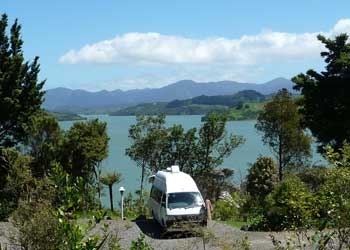 Our Rawene accommodation is situated on a hilltop, sheltered by tranquil native bush offering guests the opportunity to relax and enjoy stunning views over the Hokianga Harbour. You can choose from a wide range of accommodation: ensuite unit, kitchenette cabins, budget cabins, or power campervan sites and tent sites. Nestled in native bush, our tent sites are ideal for couples and families wanting space, tranquility and peacefulness. Tent sites or Power tent sites are available on request (no online booking!). The fully-equipped communal kitchen is available for your use. We provide two communal bathroom areas with unmetered hot showers. 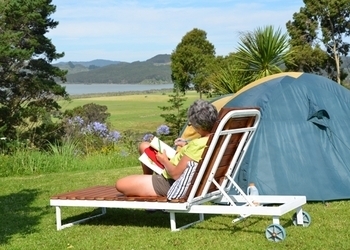 Powered sites for campervans, motorhomes and caravans. If you require a powered site for a tent please do let us know. The fully-equipped communal kitchens and BBQ areas are available for your use. We provide two communal bathroom areas with unmetered hot showers. 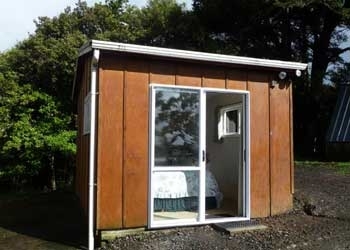 Ideal unit for a couple or a single person who appreciate having their own private bathroom. Very private location within the park grounds and magnificient harbour views. Studio-style unit with a queen-size bed, full linen and towels provided. The unit has an ensuite shower and toilet. The kitchenette is equipped with a fridge, microwave, jug, toaster and crockery. Coffee, tea and milk provided. The fully-equipped communal kitchen is available for your use. 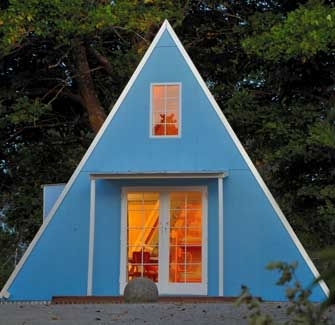 Ideal accommodation for a couple or a single person. 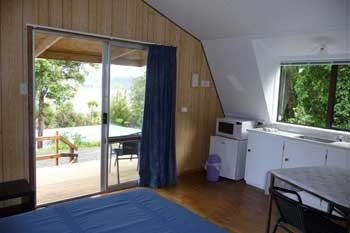 Free-standing chalet cabin with a covered deck overlooking the Hokianga Harbour. The cabin has a queen-size bed, full linen provided. 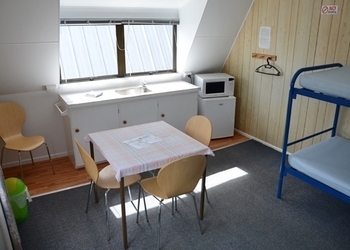 The kitchenette is equipped with a fridge, microwave, jug, toaster and crockery. 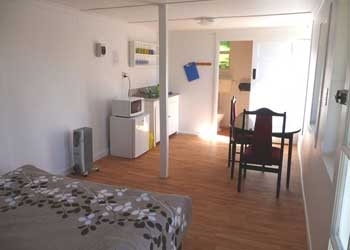 The fully-equipped communal kitchen and the communal bathroom area with unmetered hot showers are close by. 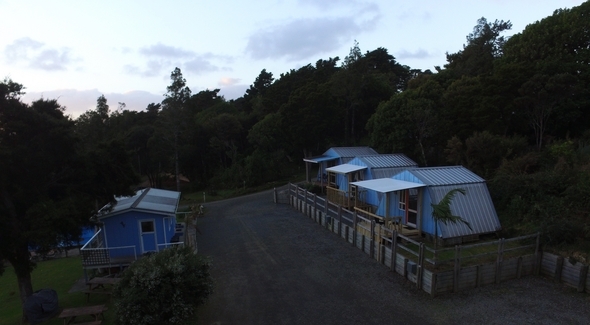 Free-standing chalet cabins with a double bed and a single or a bunk bed. Sleeps from 1 up to 4 persons. You can bring your own blankets or hire them from reception. Beds are equipped with flat sheets, pillows and pillow cases. The kitchenette is equipped with fridge, microwave, jug, toaster and crockery. We provide communal bathroom areas with unmetered hot showers, communal kitchens and BBQ area. Free-standing double-storey chalet cabin. Sleeps from 4 up to 6 persons. 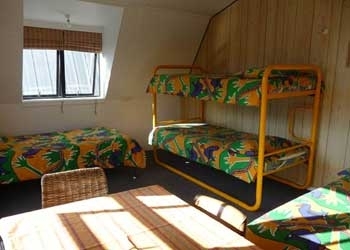 The cabin has a double bed, a bunk bed and two single beds on the upper storey. You can bring your own blankets or hire it from reception. Beds are equipped with flat sheets, pillows and pillow cases. The kitchenette is equipped with fridge, microwave, jug, toaster and crockery. The fully-equipped communal kitchen, communal bathroom area with unmetered hot showers and BBQ area are nearby. 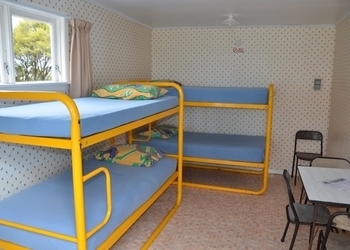 Free-standing chalet cabin with a double bed, a bunk bed and a single bed. Sleeps from 3 up to 5 persons. You can bring your own blankets or hire them from reception. The beds are equipped with flat sheets, pillows and pillow cases. The fully-equipped communal kitchen is available for your use. We provide two communal bathroom areas with unmetered hot showers. Smaller kitchenette cabin with a Queen size bed. Ideal for a couple or a single person seeking accommodation at a low price. The beds are equipped with a fitted sheet and pillows. You can bring your own blankets or hire them from the reception. The fully-equipped communal kitchen is available for your use. We provide two communal bathroom areas with unmetered hot showers. The cabin is available on request by phone or email. Basic cabin with single beds. Ideal for friends on a budget. Fitted sheets and pillows are provided. Bring your own sleeping bag or hire a blanket from the reception. The fully-equipped communal kitchen is available for your use. We provide two communal bathroom areas with unmetered hot showers. 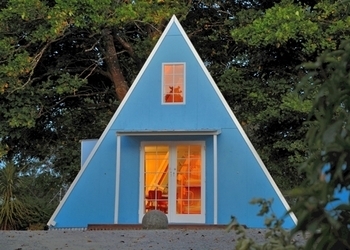 The Basic Cabin is available on request by phone or email.